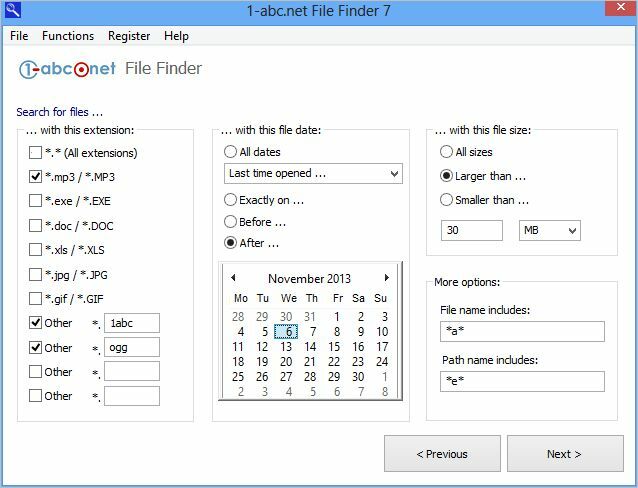 1-abc.net File Finder - Never waste time with data searching anymore! Let’s be honest: Does any Windows user always save his or her files to a place where he or she will really find it again immediately? Some documents are located on a DVD, some music was saved to a desktop folder and pictures sent by a friend were written to an external drive. Some months ago a program was downloaded to a temporary folder, someone started to collect data for later use on another hard drive partition and exported e-mail attachments can be found again later directly under “MyDocuments”. Megabytes and Gigabytes of data are saved totally un-organized to hard disks and other media. One of the things, users do with their computers most often is trying to find these old files again they remember to have. This is the truth how most Windows computers look nowadays. 1-abc.net File Finder is the right solution for this problem. Select one or more paths (or even a complete drive if you wish), configure how the searching process will behave and get a list of all these files you are missing. After that, you can save the results list as a *.txt file or your personal searching options to find your data next time even faster! You are able to configure your search concerning file extension, concerning date of last use, creation or last changes, concerning file size and much more. 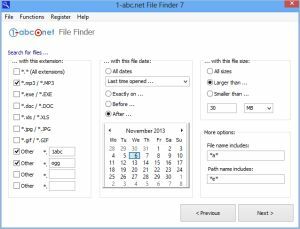 With 1-abc.net File Finder you will find what you are missing while others are still watching the animated dog of the Windows search wizard and will never lose it again!